OK, so I was really, really struggling to come up with some kind of funny pun on a Kentish theme. This was the best I could come up with. Get Dover it ! Deal with it ! Don’t turn it into more Thanet needs to be. 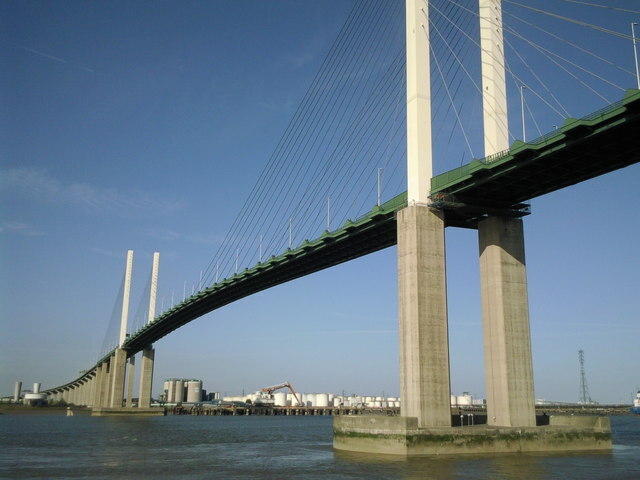 And while we’re on the subject of things I always do, due to a lack of intelligence, creativity or enthusiasm (delete as appropriate, or just leave all of them there if you want), here is the obligatory picture of the QEII Bridge. When I crossed it on this day it was still dark (just) and it was still free (just). But more of that later, like in the next paragraph. The plan for the day, such as it was, was to go to the 2017 Kent Mega event, which was being held at its normal location of The Hop Farm – Kent’s premier family day out and home to the world’s largest collection of Oast Houses. It must be popular, because it has brown signs up on the M20. Anyway, that sounds like I’m extracting the Michael, which is not my intent. It’s a great location for a caching event, by virtue of it having masses of open space for caching and for parking. As this particular part of Kent is at least 2 hours drive from home, even at the crack of sparrow-fart, I took the view that it was either going to be a full-on day of caching, or I wasn’t going to go at all. I took this decision at some point after getting home from a business trip to Munich on Wednesday night, and from there it was mainly a matter of agreeing the plan with Senior Management and deciding upon a more detailed schedule. As the event was running from 10am to 4pm that meant any serious caching would have to be done either before or after the event (or both). I opted for “before” with a decision to set off really early, do a load of caches, and then chill out a bit at the event in the afternoon. Any further finds made after visiting the event would be regarded as a Brucie Bonus. This meant an early start, and the early start meant I was going alone. Well, the kids have been out on more than one occasion in April anyway, and my late decision to go pretty much assured that all the other cachers I know had already made plans for the weekend. So, back at the plot, I was in my car at a very fresh (bordering on downright cold) 4:15am, heading off down the motorway after first stopping to fill up both the car and myself. I didn’t really buy anything for lunch though, just breakfast and travelling snacks. Anyway, I’m not a great fan of the supermarket sandwich. It promised to be a long day, especially if you don’t like puns. My first stop for caching was a part of jazzyjessups’ COE series (“Counties of Europe”), which seem very new and were therefore likely to have been put out specicially for the event. These consist of a couple of hundred caches of varying types. This first batch were mainly traditionals with a couple of multis thrown in for good measure. This first loop was just to the north of East Peckham, beginning at the redundant St Michael’s Church. I’d measured this stretch at something less than 4 miles and with a total of 22 caches. At normal caching speed for me that means about 2 hours. I think I signed my first log at just after 6:30am. As it turned out, 2 hours was quite generous, and I was back at my car at 8:10am, having found everything pretty much without incident. That’s a good start. From there I drove down to another bit of East Peckham and set off on a somewhat longer loop, having done a couple of drive-bys on the way through. This second loop was supposed to be somewhere between 8 and 9 miles and contained 58 caches or so. In the end it turned out to be 10 miles, mainly because I didn’t execute my walking plan very well, so found myself at the end of all the caches but with a mile to walk back to my car. Anyway, by the time I drove down to the event site I’d got 82 finds on the board and it was only 1:30 in the afternoon. I now see how people manage to do silly numbers like 200 in a day. I’d made 82 finds in a little under 7 hours and if I’d pushed it I could have started at least an hour earlier. At this time of year on a sunny day it’s tolerably light until after 8pm. Maybe one day over the summer, huh ? Back at today, I did a trad stuck to the back of a sign on the way into the event site and then meandered up to the actual event. The event tent was very quiet compared to some I’ve visited. I guess lots of people were out doing caches. Anyway, I bumped into the Happy Hunter at the chip van (sounds like a cue for a song) and took note of the locations of the lab caches, which were across a field and in a small woded area. They were quite good fun, as these things go. Then back at the chip van I bumped into the Happy Hunter again, this time along with Miss Chief and Nigel. As they were having a quick snack I joined them for a bit, as my little legs were ready for a sit down, and anyway it was warm. The lunchtime queue had gone, so my restorative tray of chips with mayo and fizzy drink were served up in double quick time. Feeling somewhat refreshed it was then time to have a crack at the interesting looking Wherigo they’d placed at the event site ( Count to Five (HHCIB) ). The idea of this game is that you have to walk 100m or so out along each of five different footpaths trying to establish which is numbered 1, then 2, then 3, etc. Which number represents which path is determined randomly for each player as they start the cartridge, and at any point if you get your numbers out of sequence you have to go all the way through from #1 again. I started off walking randomly with Miss Chief and Nigel and as it turned out, the firs place we walkd was #1 for me but not for them, as a result of which we then split up to complete the task. Having foundf my #1 I then had 4 shots at finding #2. It took me all 4 before gettnig the correct one, hence four trips back to my #1 point. When I eventually found #2 I then had a one-in-three choice for my #3 and as luck would have it I chose correctly first time. Three down, two to go. Except I managed to guess correctly for my #4 aswell, meaning I was done apart from actually walking into my #5 zone to end the cartridge and get the cache coordinates. I then stood around for 20 minutes extra waiting for Miss Chief and Nigel (OK, mainly Miss Chief) as they managed to get every single choice incorrect – 5 attempts at #1, then 4 attempts at #2, then 3 attempts at #3, etc. – each time having to return to their start point to work all the way through again. It was truly impressive to watch. By the time they’d done the event had officially finished, so we walked across the field to grab the actual Wherigo cache box and then returned to the event hall before parting ways. By this time I was sufficiently close to 100 finds that I couldn’t contemplate giving up. In fact, I was toying with the idea of heading for a new PB at 112 finds. I left the event site and managed to find 5 more in pretty quick order, as they were in effect just off the event site and were accessible by car. After this I picked my way along towards Laddingford and a couple of puzzles that I’d managed to acquire the solutions for, but by this time I was rapidly losing my enthusiasm, even though it wasn’t even 6pm. I reckon a keen person could have kept caching around here through all the hours of daylight and got very close to 200 finds. By the time I got home and added up all the doings, I’d found 100 “normal” caches plus the 10 lab caches, for a very handy total of 110 in the day. I started driving home at 6pm because I’d really had enough for one day, so I got home at about 8pm, including a stop for Chinese takeaway on the way in, and I then proceeded to drink far too much wine far too quickly whilst typing up logs and waiting for Match of the Day to come on. The football was rubbish, but it had been a good day of caching.